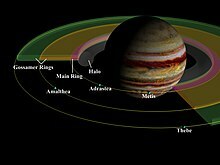 The Rings of Jupiter are a number of rings which circle the planet Jupiter. It was the third set of rings found in the Solar System after the rings found around Saturn and Uranus. The rings are very difficult to see from Earth, needing the most powerful telescopes. They were not discovered until the Voyager 1 space probe visited the planet in 1979. The Galileo space probe carried out more studies in the 1990s. The Hubble Space Telescope and large Earth telescopes have provided information recently. The ring system is faint and is made mainly of dust. It has four main parts: a thick inner ring known as the "halo" ring, a bright but very thin "main" ring, and two outer, wide, faint "gossamer" rings. These gossamer rings are made from dust from the moons Amalthea and Thebe and have been name after them. They are known as gossamer rings because they are transparent, or "see through". ↑ de Pater, I.; Showalter, M. R.; Burns, J. A.; et al. (1999). "Keck Infrared Observations of Jupiter’s Ring System near Earth’s 1997 Ring Plane Crossing" (pdf). Icarus 138 (2): 214–223. doi:10.1006/icar.1998.6068. http://www.astro.umd.edu/~hamilton/research/reprints/DePater99.pdf. ↑ 2.0 2.1 Smith, B. A.; Soderblom, L. A.; Johnson, T. V.; et al. (1979). "The Jupiter System through the Eyes of Voyager 1". Science 204 (4396): 951–957, 960–972. doi:10.1126/science.204.4396.951. PMID 17800430. ↑ Showalter, M. R.; Burns, J. A.; Cuzzi, J. N.; Pollack, J. B. (1987). "Jupiter's Ring System: New Results on Structure and Particle Properties". Icarus 69 (3): 458–498. doi:10.1016/0019-1035(87)90018-2. ↑ Meier, R.; Smith, B. A.; Owen, T. C.; et al. (1999). "Near Infrared Photometry of the Jovian Ring and Adrastea". Icarus 141 (2): 253–262. doi:10.1006/icar.1999.6172. ↑ Esposito, L. W. (2002). "Planetary rings". Reports on Progress in Physics 65 (12): 1741–1783. doi:10.1088/0034-4885/65/12/201. http://www.iop.org/EJ/abstract/0034-4885/65/12/201. This page was last changed on 4 September 2015, at 00:42.